You could be excused for thinking that this doesn't look much like a lighthouse and, in a sense, you would be right because it is actually now a war memorial. However, it once was a lighthouse. It was originally constructed in 1838 at Staincliff in Seaton Carew with the aim of assisting ships to avoid the Longscar Rocks, a dangerous reef just offshore in the vicinity. The light doesn't appear to have been a great success in its primary role and, when the Heugh lighthouse was first lit in 1847, it was rendered redundant and has been inactive since then. 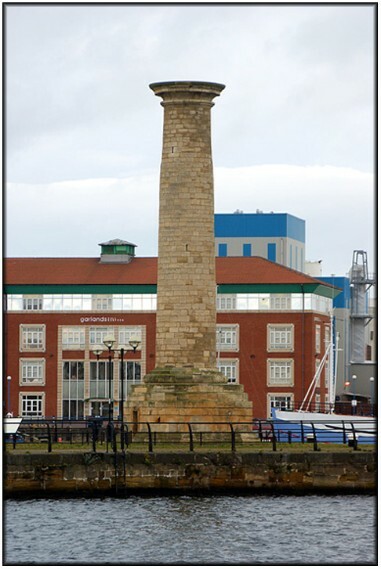 In the late 1990s a major redevelopment of the derelict sections of Hartlepool Docks was carried out, one of the main features of which was the construction of Hartlepool Marina in the section formerly known as the Old Coal Dock. At that time, the lighthouse was dismantled, its lantern removed, and the stone tower was re-erected as a war memorial at the end of the southern entrance pier. Access is no problem as there is ample parking in various spots arond the marina. Photograph can be a little tricky as the backgrounds are rather cluttered, mostly with modern appartment bulidings, as can be seen in this image.